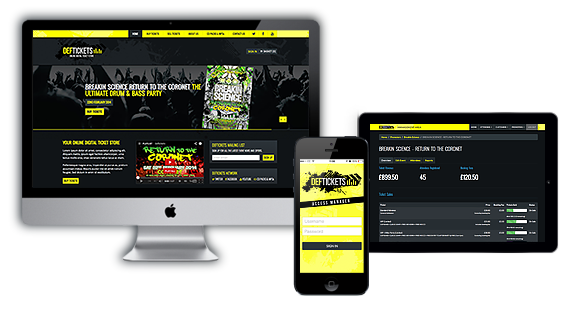 It couldn't be easier to sell your event tickets via the DEFTICKETS.CO.UK store and feature on the country's fastest growing online outlets for Drum & Bass, Jungle and Old Skool. We work with the UK's biggest promotions including BREAKIN SCIENCE, JUNGLE MANIA, MOONDANCE, SUNBEATZ, DEF:INITION, ONE NATION, PURE SCIENCE, INNOVATION, GARAGE NATION, AWOL RAINDANCE, SLAMMIN VINYL, SHOGUN AUDIO, SPECTRUM, FRANTIC & many more. DEFTICKETS.CO.UK boasts an ever growing live database in excess of 50,000 unique email addresses. Use your own artwork or we can create a simple design for you. DEFTICKETS.CO.UK currently receives over 300,000 hits per month. The slide will stay live until the Event has finished (or another agreed date if not for an Event). The slide can link to any event or product. Please contact us to discuss these or any other marketing needs. Alternatively email us info@deftickets.co.uk.